The United States health care system is the most expensive in the world with an annual spending of $3 trillion or $9,523 per person, accounting for 17.5 percent of the gross domestic product. 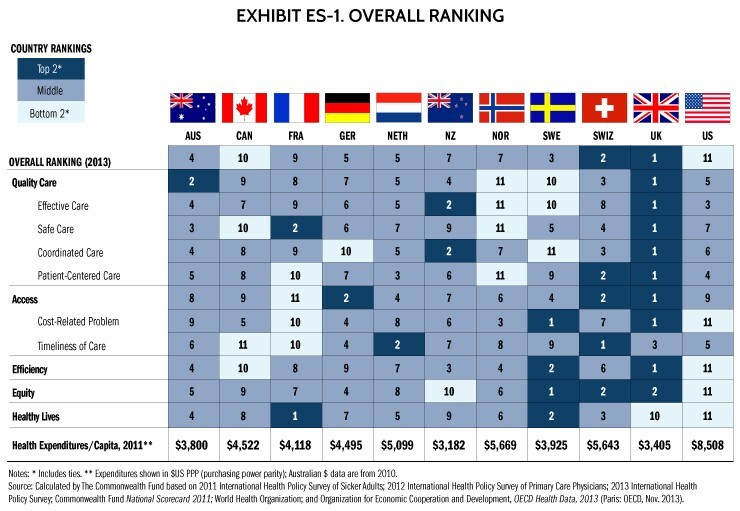 But, consistent analysis shows that the healthcare system in the US is one most underperforming among developed nations. It was ranked last in the 2014 Commonwealth Fund survey 2014 for the fifth time. According to the reports published by Commonwealth Fund titled ‘How the Performance of the U.S. Health Care System Compares Internationally’. They studied 11 industrialized nation and the performance of their health care infrastructure. The US ranked last among the 11 countries which included the UK, it was ranked the best among all countries. The other countries involved in the study were Germany, the Netherlands, New Zealand, Australia, Canada, France, Norway, Sweden, and Switzerland. The factors considered for judging the survey included quality of care, access to medical facility, efficiency, equity, and healthy lives. In the funds National Scorecard, quality of care can be defined as — one that is safe, effective, coordinated, and patient-centric. One of the most significant revelations of the report was that the excessive rate of health care expenditure is not commensurate to the satisfaction of patients or quality of service. The report summarizes, gaps in coverage and high out-of-pocket costs. By observing the report, you can clearly map the deficiency in the US health care system. The areas where the US ranked last among the 11 nations were cost-related problems that restricted access to quality care, the efficiency of treatment, equity, and the decreasing healthy lives of citizens. “Disparities in access to services signal the need to expand insurance to cover the uninsured and to ensure that all Americans have an accessible medical home,” it stated. The key parameter that separated the US health care from other industrial nations was lack of universal health care. Despite all the shortcoming in the report, there were some key positives such as the Affordable Care Act — which aims at increasing the health care coverage; lower the cost of care; etc., financial assistance for low-income group families, and provide transparent information. All these initiatives are expected to increase the efficiency and effectiveness of the United States health care system.